Mysterious and ambient, Etro’s Messe de Minuit literally translates as Midnight Mass – a scent that celebrates the grand ritual of attending church in the middle of the night. Resinous incense, vanilla and honey, together with cinnamon and patchouli create a dark and resonating character. An ode to the spectral fragility of nature after dark. This white floral fragrance from Cartier paints a picture of a majestic lily lit by the glow of the moon with delicate green notes of honeysuckle, lily and cyclamen, together with subtly spicy top notes of pink pepper and juniper berries. Guerlain L’Heure Bleue is Jacques Guerlain’s ode to his favourite time of day – the time when the sun is setting and the evening begins. It evokes the harmony and tranquillity of the world as the sky turns to velvet with beautifully feminine notes of rose, iris, violet and vanilla. 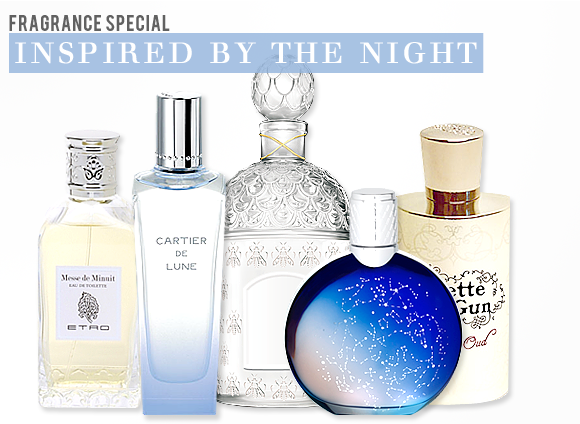 Inspired by the night sky over Place Vendome, Midnight in Paris is a unique and multi-faceted fragrance that sparkles like the cosmos. Intense notes of inky styrax, tonka and benzoin create depth, while lemon, green tea and lily elevate the scent up into the stars. This interpretation of Juliette sees her as a fugitive escaping from a palace at the witching hour. She is protected by her fragrance, a heady blend of Rose, Saffron, Oud, Amber and Woods, which she wields as a weapon of seduction. A blend that is both precious and majestic. This entry was posted on Wednesday, September 5th, 2012 at 10:16 am and is filed under Fragrance. You can follow any responses to this entry through the RSS 2.0 feed. You can skip to the end and leave a response. Pinging is currently not allowed.